Wondering how to find Real-Time reports in Google Analytics? Real-Time reports allow you to monitor activity on your site right as its occurring. You can view the number of active users on your site at any given moment, their geographic locations, the pages they’re viewing, and more. Real-Time reports are really useful for marketers to track responses to marketing campaigns, product releases, and new articles. That’s why, in this article, we’ll show you how to find Real-Time reports in Google Analytics and also share some tips on how to properly analyze and use them. Let’s get started with the simplest way to find your Google Analytics Real-Time reports. If your site was built using WordPress, you can find your Google Analytics Real-Time reports right on your WordPress dashboard using MonsterInsights. MonsterInsights is the best Google Analytics plugin for WordPress. It allows you to install Google Analytics into WordPress sites easily with just a few clicks of your mouse, and provides you with comprehensive reports directly on your WordPress dashboard. But, first, you’ll need to download the MonsterInsights plugin, install it in your WordPress site, and set up Google Analytics with it. If you need detailed instructions, here’s our step-by-step guide on how to set up Google Analytics in WordPress with MonsterInsights. 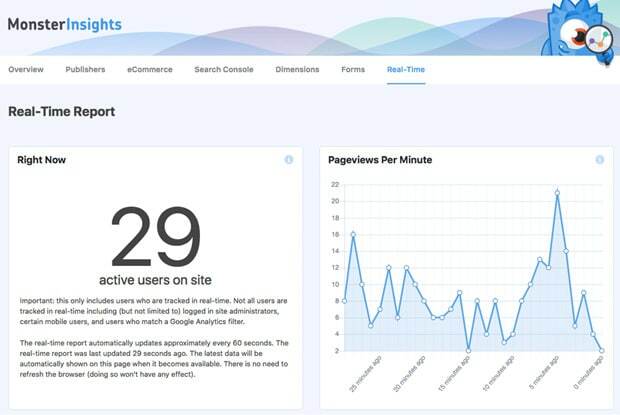 After you’ve connected your WordPress site with Google Analytics, you can view your Google Analytics Real-time reports on your WordPress dashboard. Go to Insights » Reports from your WordPress dashboard and then click the Real-Time tab. 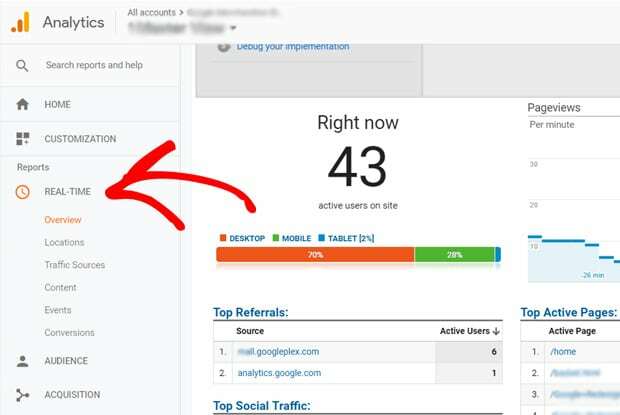 In some reports, like Top Pages and Top Referral Traffic Sources, you’ll see a button to view all pageviews and referral traffic sources at the bottom. You can click on the button to view the full report on the Google Analytics platform. 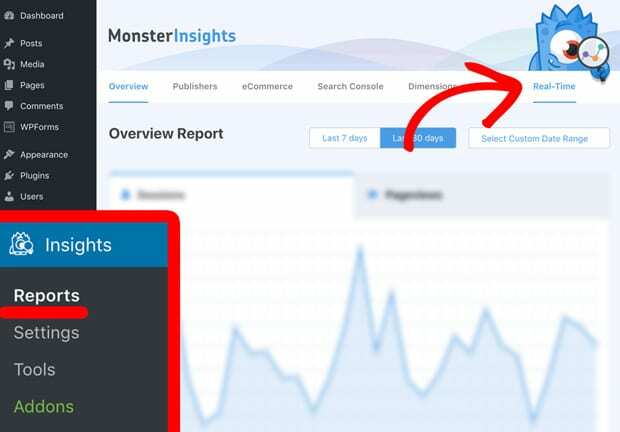 Note: Real-Time reports feature was added in MonsterInsights version 7.3.0, so you need to have at least this version or later version installed on your WordPress site. Then, you can see the Real-Time section on the left-hand side of the Reports column. Simply click on it and then on the Overview submenu. Now you can see the Overview report for your Real-Time data. To view more data in the Real-Time reports, you can click the submenus below the Overview submenu in the Real-Time section. 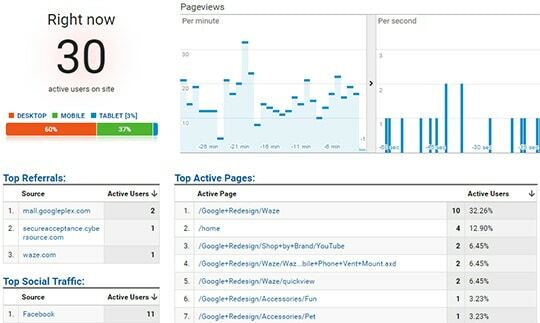 The Real-Time reports in Google Analytics are very important for website owners. These reports can give you really insightful information and data to analyze your marketing campaigns and grow your business. Let’s discuss 3 of the major benefits of using Real-Time reports. 1. You can track active users on your site right now. Keeping eyes on the Real-Time reports at different times throughout a day lets you find out what time your site is most visited. Then, you can publish major announcements, product releases, and blog articles during that time of the day for more visibility. 2. You can track the results of your marketing efforts as they happen. It’s useful for tracking how your email marketing, social media marketing, and other paid marketing campaigns are performing. With the Real-Time reports, you don’t need to wait until a later date to see how users are reacting to your marketing campaigns and new product. 3. Next, referral traffic sources and top places data in the Real-Time reports will help you to decide where to concentrate your marketing efforts and at what time. When you know the actual locations where most visitors on your site are coming, you can improve your marketing campaigns by making them specific to those locations and time zones. Hence, Google Analytics Real-Time reports help you improve your website marketing and grow your business. We hope this article helped you learn how to find Real-Time reports in Google Analytics and how to use them. You may also want to learn how to add a stats dashboard on your WordPress site. Don’t forget to follow us on Twitter and Facebook for more helpful Google Analytics tips.